This page only represents the opinions and findings of Barry S. Roffman. Questions about it should be only addressed to BarrySRoffman@Gmail.Com. Updated on 12/8/2017. Part 1 of this article will first quote, review and expand the article by Gilbert V. Levin entitled the Curiousness of Curiosity published in Astrobiology, Volume 15, Number 2, 2015. Direct quotes of Dr. Levin will be shown with dark blue italic fonts. Our comments will be in black. We will try to show that Levin and his colleague, Dr. Patricia A. Straat, should be credited for having detected life at the two Viking lander sites on Mars, while Dr. James Fletcher, the NASA Administrator, took decisive action soon after the landing on July 20, 1976 and later to block these findings and to keep the truth about life on Mars from being known by the public. The article below will then examine and expand upon the interview of Dr. Levin that was conducted by Barry E. Digregorio in 2003. We will also look at what might be life on Mars (Figure 3) that was spotted by Mars Science Laboratory (MSL) on its sols 1185 and 1189. 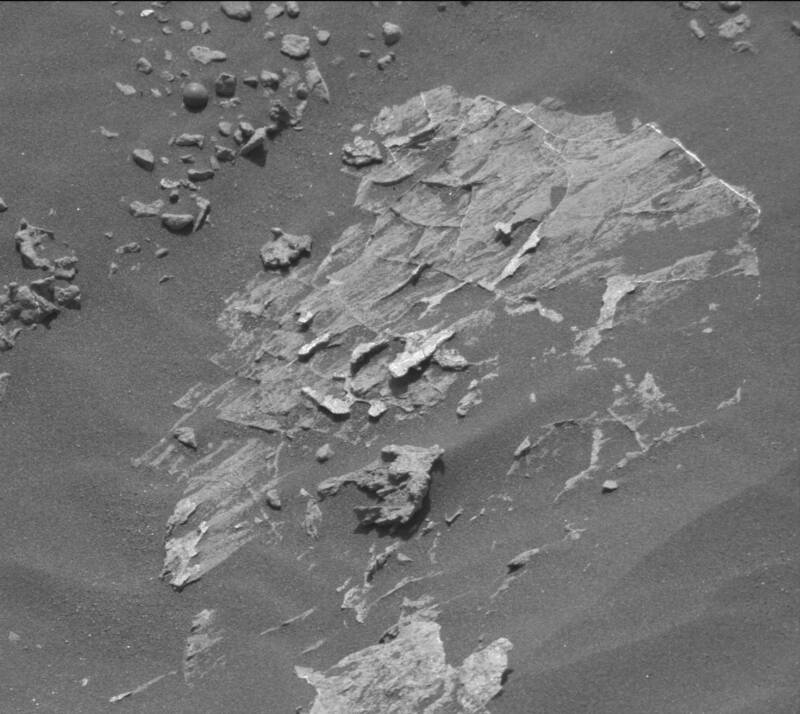 The objects seen were of great enough interest that MSL returned to within about 10 meters of them to take another look on its Sol 1248 (see Figure 4) . Part 2 is complete, but only carried on my father's private website. It presents evidence that makes clear that the scope of the cover-up about extraterrestrial life goes beyond the topic of Mars itself. Figure 1 Top - The two people primarily responsible for likely detecting life on Mars ar Dr. Gilbert Levin and Dr. Patricia Straat. Figure 1 Bottom - The man who gave the order to kill their discovery was NASA Administrator Dr. James Fletcher. Earlier he offered President Nixon a way to keep our astronauts in low Earth orbit (i.e., the space shuttle). Nixon scrubbed Apollo 18, 19, and 20. He also wanted to scrub Apollo 16 and 17, but was convinced not to by Office of Management and Budget (OMB) Deputy Director Caspar Weinberger. Figure 2 above - Location of the Labeled Release Experiment on the Viking Lander Biological Experiment System. Curiosity has reached the base of Mount Sharp, its promised land, the land where I hope it will at last perform its promised key analyses. Until now, Curiosity has been primarily an engineering mission, demonstrating an amazing landing technique and showing it can drive around the planet. The analyses reported allow NASA to state that the mission has achieved its ‘‘primary goal’’ of determining that Mars was once habitable. However, the science output has been limited and scarce. 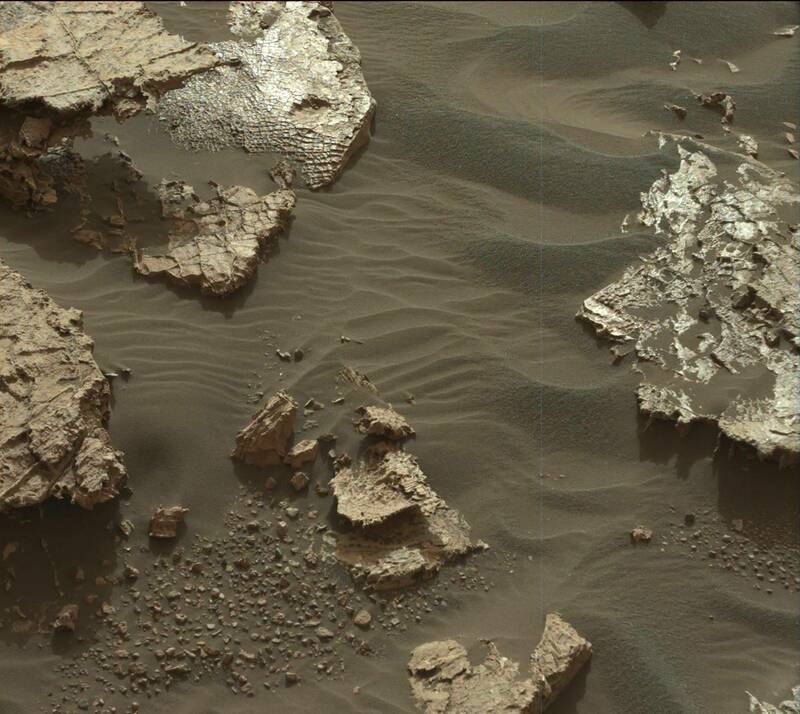 For more than two years on the Red Planet, Curiosity has unaccountably deferred performing analyses that are most directly concerned with evidence for life: the liquid extraction assay for organic compounds and the high-resolution imaging of green spots or areas Curiosity has shown on many of the nearby rocks. I believe these same comments apply to the two plus years of work already completed by Curiosity. NASA has repeatedly stated that Curiosity carries no life detection capability. This seems a very curious omission to me in that NASA has continuously stated that one of its prime objectives is to determine whether Mars had or has life. Prior to the launch of Viking, the agency stated that the search for life on Mars might be the greatest wxperiment in the history of science. Yet, despite the positive results from the Viking Labeled Release (LR) life-detection experiment in 1976, no life-detection experiment has ever since been sent to Mars. The claim that the Viking LR detected life, made by me and my Viking Co-Experimenter, Dr. Patricia A. Straat, remains disputed. Its results should certainly have been immediately queried by subsequent Mars probes. Even were the strong LR responses caused by chemistry, not life, they are an extraordinary finding that demands further investigation. Unfortunately, there was no clamor from the scientific community, and this omission will continue on the new Mars lander, tenuously planned for 2020. FIGURE 3 TOP - Green spots on rocks and blue sky originally seen by Viking 1 before NASA Administrator James Fletcher ordered manual color distortion of images on monitors at JPL. BOTTOM - The green spherical and cocoon-like objects were seen on sols 1185 and 1189. The green spheres might be photosynthetic life. As is shown on Figure 4 below, MSL returned to the area again on Sol 1248, possibly for a further look or tests to see if this is life. More spheres were seen on Sol 1555, 1571 and 1797. Following NASA’s no-life-detection statement about Curiosity, I published an article (‘‘Stealth Life Detection Instruments Aboard Curiosity,’’ Proc. SPIE 8521, Instruments, Methods, and Missions for Astrobiology XV, 852102, October 15, 2012, doi:10.1117/12.928032) addressing those Curiosity experiments I thought could confirm that the Viking LR experiment did detect life. 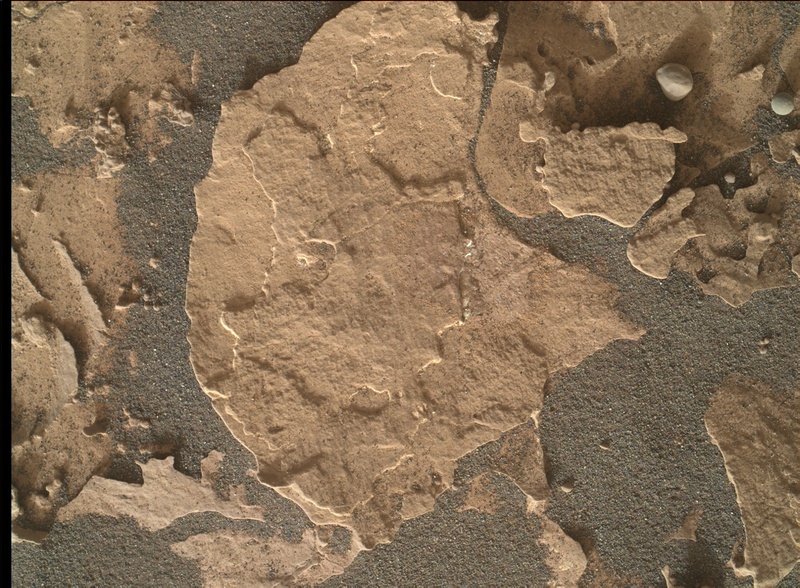 Those experiments are the liquidextraction assay for complex organics (essential to support the claim for life) and use of the Mars Hand Lens Imager high resolution camera for up-close inspection of some of the green spots shown on rocks in many of the large-scale images downloaded from Curiosity. The Mars Hand Lens Imager has a resolution of a fraction of the diameter of a human hair and therefore might reveal morphology indicative of biology. I made two predictions, as follows: (1) Curiosity would detect complex organic compounds and (2) Curiosity would confirm the presence of current liquid water (which it has since done). Neither the article nor my direct appeals to Curiosity scientists drew any comment or action on the organic and imaging issues. For part one of your request, I could not locate any responsive Government records. Please be advised that the liquid extraction protocol of SAM has not yet been used on Mars. The methods that will be used for this liquid extraction are fully described in the attached open literature. For part two of your request, please be advised that all of the raw MAHLI images are released to the public on the JPL web site, and was signed by the Freedom of Information Act Public Liaison Officer, Records manager. 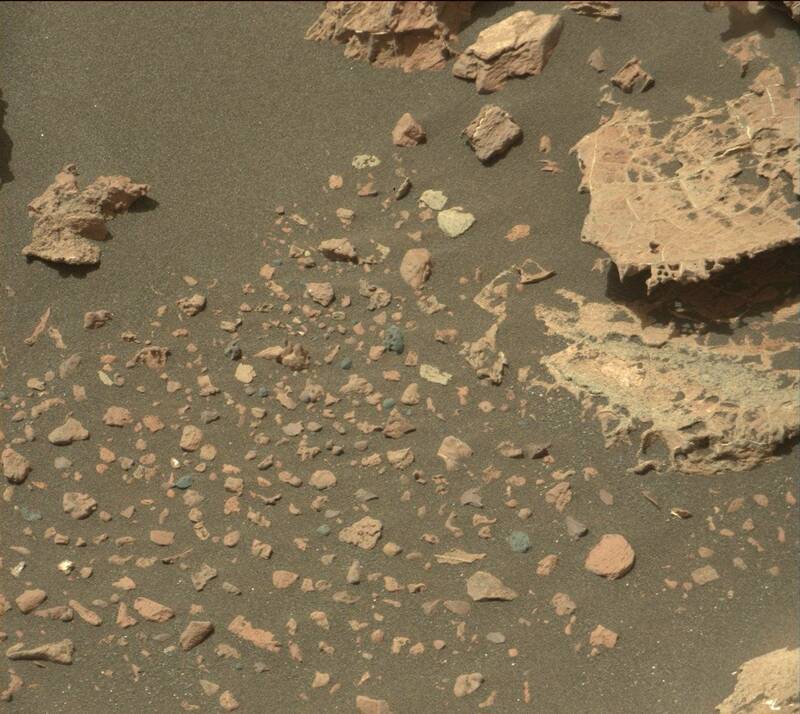 Scrutiny of published images by colleagues and myself has found no close-ups of the green spots on the rocks capable of showing possible biological patterns. Roffman Comment: However, while people with the power to control release of data may have succeeded in preventing the truth of it to the public for the Viking missions, the control over the Mars Science Laboratory is not quite as complete. The top of Figure 3 shows what Viking 1 captured while the bottom of Figure 3 shows what was found on MSL on its sols 1185 and 1189 - green spheres that might be life. Figure 4 - Elevations and ground temperatures encountered while MSL was at positions noted by JPL. Possible life was seen on Sol 1185, along with a warmer than expected high ground temperature. The position noted for MSL for Sol 1248 is a return to within 20 meters of where the potential life was seen before. Then it moved within about 10 meters of the site. See Figure 3 above to see the suspected life. Figure 5 - N-methyl-N-tert-butyldimethylsylil-triflouroacetamide, or MTBSTFA. Figure 6 - The following original data was found in an article by Barry E. Degregorio entitled The Calm Before The Storm: An Interview With Dr. Gilbert Levin. It was published in Los Angeles, CA in Nov 17, 2003. Note that Degreorio is on the first list above. Aspects of Gregorio's interview with (and support for) Levin will be discussed below. With respect to the SAM's liquid extraction efforts, in March 2015 I wrote the following about how that plan failed. Some organic material used in "wet chemistry" section of SAM had apparently leaked out of its container. Wet chemistry is used if it looks like complex organics - which would be destroyed in ovens - might be found. Curiosity brought up some cups to hold for such testing. The sealed cups hold N-methyl-N-tert-butyldimethylsylil-triflouroacetamide, or MTBSTFA (see Figure 5, ignore the issue of which goes first: N-methyl or N-tert). This accident was so serious that I believe it requires a full investigation to find out exactly how it occurred, and who (if anyone) is responsible for. Sabotage should not be initially ruled out. The vitality (pun intended) of the Viking LR remains. No experiments are yet planned to test it. The statement at the Viking exhibit in the Smithsonian also remains: ‘‘Biological experiments on the Viking Landers did not detect signs of life.’’ To say there were no signs of life is woefully incorrect. Basically, there are three types of evidence: consistent, definitive, and compelling, in increasing order of certainty. Not only are the data from the Viking LR consistent with life, nothing we have learned about Mars is inconsistent with life. Terrestrial microorganisms have been grown under conditions as severe as on Mars, even surviving in naked space on the exterior of the International Space Station. Laboratory simulations have produced evidence that terrestrial ejecta produced by meteoric impact could arrive on Mars and deposit an infectious load of microorganisms. Indeed, it would now be surprising if life were not on Mars. As to being definitive, the strong Viking LR positive and control results would certainly be definitive on Earth. Such evidence, even minus any controls, was deemed compelling by public health authorities that relied on it daily for many decades in testing food and water. Yet scientific authorities question or reject the Viking LR claim to life. This doubt remains despite the failure of all published attempts to attribute the Viking LR results to chemistry, including a recent publication stating that galactic cosmic rays and solar energetic particles transform perchlorate in the martian soil into a compound that was responsible for those results. However, even this latest claim will be scientifically refuted in a forthcoming paper by Dr. Patricia A. Straat and me. Beginning with Viking and increasingly over the intervening years, some scientists knowledgeable in the field have expressed their opinions on the LR martian results in private to me or in public statements. Thinking that other scientists might be swayed in their opinions by knowing how these experts have evaluated the Viking LR data, a list of those respondents was developed. Depending on what they said, the scientists were listed in the category of ‘‘Has Detected Life’’ or ‘‘May Have Detected Life.’’ That list was then e-mailed to those named in it, and permission to include each one’s name in a public article was requested. The updated list, with each name approved for such use, is shown in the accompanying Table 1. Note that none in this first list have active NASA e-mail addresses. Note the three NASA members, including Chris McKay, discussed earlier. Figure 7 below - Visit to this article on my father's MarsCorrect.com site by the National Academy of Science on July 20, 2016, the 47th anniversary of the moon landing by Apollo 11. To my friends at the Academy, it's time to give Dr. Levin his proper due. This guy deserves the Nobel Peace Prize. Give us the truth and make the nomination! In light of the continuing controversy, perhaps a review of the Viking LR data by an independent panel, against the background of what we have learned since Viking about Mars as a habitat and about extremophiles on Earth, could resolve this major scientific issue. At a minimum, such a review would help NASA better formulate its plans for future Mars missions. (1) Implementation of Curiosity’s liquid extraction protocol for organic compounds. 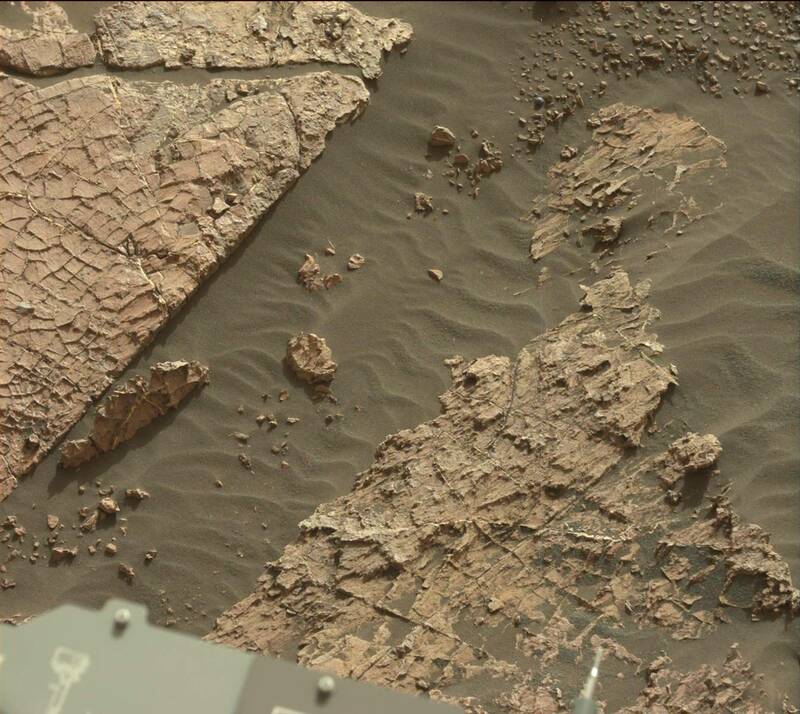 (2) Taking of high-resolution close-ups of green spots on rocks by Curiosity’s Mars Hand Lens Imager. (3) Review by an expert panel of the 1976 Viking LR data and other information pertinent to life on Mars. Digregorio: 5) When did NASA officially fund you for this? Levin: In 1959 NASA funded my proposal to develop my radiosrespirometry experiment to go to Mars. Roffman Comment: This was in the Cold War, a year after a conference in Japan that brought together American and Russian scientists involved in nondestructive testing. In general, these scientists would normally try to back engineer military technology that was captured from each other to learn how to defeat such threats. This will only be discussed in Part 2 of my article. Digregorio: 7) How did you eventually get a place as a Principal Investigator for biology on the Viking mission to Mars? Levin: Ten years after I started my work for NASA, the agency announced the creation of the Viking mission to Mars: twin spacecraft to be launched in 1975 to rendezvous with the red planet in 1976. Roffman Comment: Ten years after 1959 would be 1969. This was the year that Apollo 11 landed on the moon. During this mission Apollo 11 radioed Houston about an unusal siting on the way to the moon. Buzz Aldrin discusses what they saw at https://www.youtube.com/watch?v=XlkV1ybBnHI. It was two years after other events (to be discussed in detail in Part 2 of this article) that collectively may have affected NASA's readiness to publically accept positive results in life detection experiments. Levin continues: Each spacecraft consisted of an orbiter that was to circle mars, and a lander that was to be gently deposited on the surface. Roffman Comment: The positive results of the labeled release results on the two Viking landers are not the end of controversy on this mission. The orbiter for Viking 1 also showed the famous "face" at Cydonia on Mars. NASA took questionable actions with respect to the orbiter images, but these will only be discussed in Part 2 of my article. Levin continues: The first lander was scheduled to land July 4, 1976. NASA then asked for proposals for experiments for the mission, the chief announced objective of which was to search for life. All of us developing life detection experiments under NASA's science program submitted proposals applying for the Viking mission. The selection process was rigorous, with each candidate being examined by 4 separate review panels, one of NASA scientists and the others consisting of renowned university researchers. Four experiments were selected to be flown aboard each Viking lander. The excellent success in rapidly detecting the broadest possible array of microorganisms in soils from around the world and also in laboratory cultures, together with its small and efficient instrumentation, won a spot for my labeled release experiment. The other experiments selected were the "Wolf Trap," that monitored a vial of water for increasing turbidity after a soil sample was placed in it; the 'Gas Exchange' experiment that measured for changes in the composition of the atmosphere above a vial of "chicken soup" nutrient into which the soil sample was placed; and the 'Pyrolytic Release' experiment that was a modification of my dark release experiment which looked for the photosynthetic incorporation of radioactive carbon dioxide and/or carbon monoxide by organisms in the soil sample. Digregorio: 8) But only three of the biology experiments were actually flown. What happened to the fourth biology experiment? Levin: The concept was to select experiments that tested for life under Martian conditions. The principal environmental condition was water. It was, therefore, decided to select experiments that covered the entire spectrum of possible water abundances. The Pyrolytic Release experiment was based on the presumption that mars was bone dry and thus added no water. The Labeled Release experiment added only one drop of water, placed at the center of the soil sample so that, as it migrated to the edges, a continuum of wetness would be supplied, declining with distance from the center. The Gas Exchange experiment added enough nutrient solution such that the entire sample was wetted. The Wolf Trap, however, placed a small sample of soil into a relatively large volume of water, inundating any microorganisms in the sample. Accordingly, NASA eliminated the Wolf Trap. Development of the other three experiments was completed and they were, indeed, flown to Mars aboard each of the Viking spacecraft. Digregorio: 13) In 1997 you made the claim that you discovered microbial life on Mars with Viking in 1976. Why did it take so long for you to reach this conclusion? Levin: There was strong opposition to any biological conclusion, based primarily on the failure of the Viking GCMS to detect organic molecules. Roffman Comment: As of April 2015 we now know that Mars Science Laboratory has at a minimum found the following organic chemicals at Gale Crater: methane, chloromethane, dichloromethane, trichloromethane, tetrachloromethane, dichoroethane; 1,2 dichloropropane; 1,2 dichlorobutane, and chlorobenzene. See our article about organic chemicals found at Gale Crater for more details. Levin continues: Then Dr. Orgel came up with his H2O2 oxidant theory, after which a plethora of variant oxidant theories were put forth until the present. Many other theories were also put forth. These were all capped with the insistence by people such as Norman Horowitz and Chris McKay that there could be no liquid water on the surface of Mars, hence no life [Chris McKay has radically changed his view in the last few years favoring the possibility of occasional liquid water at the surface of Mars]. Norman Horowitz (March 19, 1915 to June 1, 2005) "believed that his failure to find life on Mars justified a much broader conclusion: 'Since Mars offered by far the most promising habitat for extraterrestrial life in the solar system, it is now virtually certain that the Earth is the only life-bearing planet in our region of the galaxy. We have awakened from a dream." That conclusion, found in his book To Utopia and Back, is one that most would agree is too general based on what we know about one nearby planet.'" Horowitz was a member of both the National Academy of Sciences and the American Academy of Arts and Sciences. In 1965 he began work with the Jet Propulsion Laboratory in Pasadena, serving for five years as chief of JPL’s bioscience section and as a member of the science teams for the Mariner and Viking missions to Mars. From 1977 to 1980, he was chairman of the biology division at Caltech. Among advocates of space exploration, he was noted for his opposition to a space program centered on the use of human astronauts. Charlene Anderson recalls, "In personal discussions, he could be particularly vociferous on the topic of human versus robotic exploration. Norm argued that human exploration could only interfere with scientific exploration and confuse the public as to why we should explore space. In his view, science should drive the endeavor, not a lust for adventure." Under my operating system the remark about opposition to human exploration of space places Horowitz in the villain category. Without humans on scene to make observations, data can be controlled and distorted to support political agendas. Gilbert Levin's son, Dr. Ron Levin, was in the JPL control room when the first color images of the Viking 1 landing site were received. The sky was blue, and there was green on rocks. NASA Administrator James Fletcher ordered the color monitors to be manually altered to hide these colors, and the truth with it. When Ron and others protested and tried to regain the original color they were told that anyone tuning the monitors back would be thrown out of the control center. Ron knew that the order was unjustified. A robot wouldn't give a damn. It would just accept reprogramming. As for Chris McKay his initial opposition to Levin's conclusion helped to kill even robotic exploration of Mars for decades. Gil Levin was happy to put him in the list of people who now see the detection of life by the Vikings as something that may have happened, but the word may implies a tremendous amount of wiggle room. In his favor is that he seems to be open minded, but we have to wonder if NASA would allow him to keep his job if he came down squarely on the side of both Dr. Levins. Clearly McKay knows about the color distortion issue and the Cydonia isssue, and Levin concludes his interview with Digregorio (below) by stating that that McKay has "an extreme determination to mislead the reading public." Levin continues: I followed and refuted all the arguments, as, for example, in my 1986 paper to the National Academy of Science, which concluded with the statement that it was then as probable as not that the LR had detected life. However, this was greeted with derision. Barry Roffman Comment: FIRST LET ME POINT OUT THAT ON JULY 20, 2016, AFTER I HAD PERSONALLY DISCUSSED THS ARTICLE WITH A NUMBER OF TOP NASA AND SPACE-X PERSONNEL HERE IN CAPE CANAVERAL IN THE LAST WEEK, THE NATIONAL ACADEMY OF SCIENCE ACCESSED THIS ARTICLE ON MY SITE AT 11:26:17 MST. SEE FIGURE 7 ABOVE. Derision is one of the biggest guns in the Government's arsenal when it comes to hiding the truth about Mars, and for that matter, UFOs. What goes hand in hand with it is fear that anyone who speaks up will have his or her career destroyed. It is to a certain extent concern that keeps my son's name off the authorship of this particular article. He has just earned his PhD in physics. But I am retired so I have less to risk. However, less does not mean none at all. In Part 2 of this article I publish information that significantly increaseS the risk to my personal safety. Why do it? Because there are serious moral implications that go hand in hand with destroying men like the father-son Levin team. I am no fan of mind control - especially when the attempt to do so spans generations. Levin continues: I continued to study new data from Mars and Earth relevant to the issue, until, in 1997, it became obvious to me that, all facts considered, the LR had, indeed, discovered living microorganisms on the surface of Mars. Digregorio:14) Why have all the NASA Mars missions since Viking ignored placing updated life sciences experiments aboard their spacecraft? Levin: The failure to pursue NASA's highest priority (the search for life in the solar system), and the goal NASA once described as "probably the greatest experiment in the history of science," cannot be logically explained. It results from NASA's fear of finding out that its original conclusion about Viking was wrong, supplemented by philosophical and religious elements who insist, for non-scientific reasons, there can be no life elsewhere but Earth. Research Misconduct Defined. Research misconduct is defined as fabrication, falsification, or plagiarism in proposing, performing, or reviewing research, or in reporting research results. Fabrication is making up data or results and recording or reporting them. Plagiarism is the appropriation of another person's ideas, processes, results, or words without giving appropriate credit. Research misconduct does not include honest error or differences of opinion. In Case of Criminal or Civil Fraud Violations. If the funding agency believes that criminal or civil fraud violations may have occurred, the agency shall promptly refer the matter to the Department of Justice, the Inspector General for the agency, or other appropriate investigative body. As for religious elements, now you are really getting close to a core issue that will be discussed in Part 2. This summer's (2015) International Mars Society Convention will be held at the Catholic University of America in Washington, D.C. The Vatican, not wanting a repeat of what happened when it came down on the wrong side of Galileo's proof that the Earth revolves around the sun, maintains an observatory in Italy and another in Arizona. It has in the last decade made many astounding announcement about extraterrestrial life (see Catholic News Service article about aliens as our brothers), but (probably for financial concerns) it likely wants to control the rate and terms of disclosure of truth on this matter. Digregorio: 15) What kind of robotic life detection experiment do you think we could send to Mars that would unambiguously demonstrate once and for that life does or doesn't exist? Levin: I have proposed my chiral LR experiment to NASA several times since 1995, and to ESA and the Canadian Space Agency. It has been rejected (1995) or ignored every time. The only chance to investigate life on Mars came when I was a member of the JPL Mars Oxidant team, the Mox was an experiment designed to seek the putative oxidant on Mars and was placed aboard the Russian Mars 96 mission. I managed to include a chiral life detection test by modifying a small portion of the Mox experiment. Unfortunately, that spacecraft failed to reach Mars. Roffman Comment:There have been accusatations by Russian space officials that America has sabotaged Russian Mars efforts. Levin continues: The detection of active chiral metabolism in a soil sample would be uncontrovertibly evidence for life. Everyone I have spoken to about that experiment has agreed that it could give unambiguous results, including Dr. Wesley Huntress, former NASA Deputy Administrator for Science, and even Chris McKay, who worked with me on Mox. Digregorio:16) Is there any possibility that all three Viking biology experiments gave indications for life on Mars? For example, the GEX samples demonstrated that CO2 was being absorbed while giving off oxygen. Couldn't this be interpreted as photosynthesis? If not, why? Levin: No. The GEX reported an abrupt (about 2 hr) outpouring of O2. This occurred in the dark, and even before any liquid nutrient was added to the soil. Merely exposing the soil to the humidity supplied by the aqueous nutrient solution caused the brief response. This is not an indication of biology, but of chemistry - if the response were indeed correct - the raw data obtained by GEX were never published. What was published was the result of applying various correction factors to that data. Those factors themselves are suspect in that they presume knowledge about the Martian soil that we still do not have. Moreover, upon heating to the control temperature, the GEX still gave a positive response. Digregorio:17) Seven out of nine PR experiments on Mars showed minute quantities of organic material had formed from the soil samples in contrast to the negative GCMS findings. Two of these PR samples tested positive for organic material even though they were run totally in the dark without the solar simulating Xenon lamp on. How can this be explained if not by organisms? Levin: Prior to the mission, the PR experimenters stated that, because of the variable first peak results obtained in testing, a positive result would require a response in the amount of about 10,000 cpm. The PR Mars responses were only about 100 cpm, well within the noise level. Moreover, both before and after the mission, Jerry Hubbard reported PR experiments in which, even fitted with the UV filter, the instrument produced results from sterilized glass beads and soils above the "active" responses obtained on Mars. The explanation is that, both on Earth and Mars, the PR produced small amounts of organic matter. Moreover, this organic matter remained and even accumulated in the PR over time. However, the survival of the organics in the PR proved that there was no oxidants in the soil capable of destroying the organics. Digregorio:18) Finally a report in the November 7th 2003 issue of Science "Mars-Like Soils in the Atacama Desert, Chile, and the Dry Limit of Microbial Life" casts heavy doubt on whether Viking and in particular your LR instrument detected living microbes on Mars. Have you read this report and do you have a rebuttal? Rule out strong oxidants as the cause of the LR response. Rule out UV as the source of the LR response. Shows that the extended control regimens run on Mars strongly mitigate against chemical or physical cause of LR reaction. Shows a metabolic response from Antarctic soil in which GCMS detected no organics. Rule out specific oxidants recently proposed by others, and rule out oxidants in general. Not to mention any of the above is indicative of an extreme determination to mislead the reading public. With respect to the article itself, there are a number of points I will comment on to Science. They show a somewhat amatuerish, but still strongly biased approach with respect to microbiological technique, the use of appropriate controls, the interpretation of results, and the use of long-dead strawmen arguments in a vain attempt to cover up, rather than to discuss objectively, the results of the Mars Viking LR experiment. 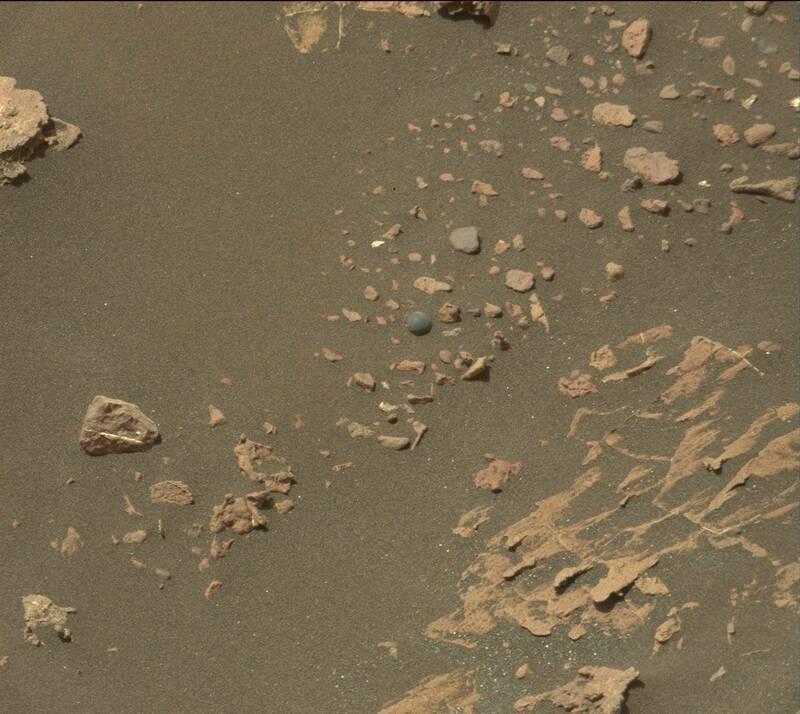 A FEW EXTRA WORDS ABOUT THE GREEN SPHERICAL OBJECTS PHOTOGRAPHED ON MSL SOLS 1185 AND 1189. Early in January, 2016 I received an e-mail from David Kiepe. He's a man with considerable experience in the field of photographic analysis of images of Mars that have sent back from our landers and orbiters over the past 40 years. Without suggesting what the (Figure 3) spherical objects seen by MSL on its Sols (Martian days) 1,185 and 1,189 were, he merely asked that I look at the “anomalies” on the photos. The first thing noticed was an egg-shaped but hollow object that looked like a geode. A geode is a round rock with a hollow cavity lined with crystals. But I didn’t see any crystals. Then Kiepe directed my attention to two greenish, spherical objects on the Sol 1,185 photo, and another on an image (not as clear) for Sol 1,189. On the top of the Sol 1185 image the sphere looked like it would fit nicely in the hollow object. The other sphere at the right side of the image appeared larger. The green objects are suggestive of life. The hollow object could be a cocoon of some sort, or a protective coating that grows at night to shield the life from cold, and then breaks open under the heat of the sun. Sols 1185 and 1189 were at Ls 75 and 77 (late fall in the southern hemisphere of Mars). The high ground temperature on Sol 1185 was surprisingly high at -3° Celsius, but the low was quite cold at -94° C (the air temperature range was -24° to -84° C). Winter began at Ls 90 on Sol 1213. The high ground temperature that day was -12° C and the low ground temperature was -87° C. Then, for some reason that I am not yet privy too, the Curiosity Rover turned around and headed back to the Sol 1185 location. As it did, it passed through 16 sols (all in the winter) with above freezing ground temperatures and another four sols right at freezing. It finally arrived at the spot with possible life on Sol 1248 (Ls 105) - 63 sols after leaving the spot. The high ground temperature that day was -4° C and the low was -90° C). However, it should be noted that the requirement for the ground temperature sensor was to measure ground brightness temperature over the range from 150 to 300 K (-123.15° C to 26.85° C) but only with (a really poor) resolution of 2 K (2° C) and an accuracy of 10 K (10° C). The green color was suggestive of something that might be photosynthetic. The spherical shapes might have evolved to allow the bottom cells to reach the top simply by rolling in the wind. Is there something analogous in Earth-based botany? Yes. When the cross section of a leaf is examined under a microscope, chloroplasts in the Palisade layer move from top to bottom and back to the top again as the cytoplasm in the cells circulates. This ensures that all chloroplasts get a chance to move up to just under the epidermis so they can absorb more ultraviolet light from the sun and increase the rate at which photosynthesis occurs, Of course, in photosynthesis carbon dioxide and water combine to form sugar (glucose) and oxygen. The Martian atmosphere is supposed to be 95% carbon dioxide, running water is believed to be found in association with RSL in Gale crater, and JPL has announced evidence for brine found by MSL. It seems likely that Viking 1, Viking 2 and MSL all saw life, but that the final decision to tell us about it has broad political implications that are yet to be resolved. Altitude variation from Sol 1185 up through 1797 was from about 4,420 meters below areoid up to 4,215 meters below areoid, an increase of 205 meters (672.572 feet). NASA’s Mars Rover Curiosity discovered plentiful indigenous spherical ooids at High Dune and Namib Dune in Bagnold dune field, Gale Crater, Mars. The Martian ooids measure about 0.2 mm to 0.5 mm in diameter. Colors of the Martian ooids are various, including white, yellow translucent, green, grey, and yellow. The Martian ooids should have been formed by microbes, because ooids of Earth have recently been found to be formed by microbes and microbial borings are found in ooids of Earth and of Mars. The Martian ooids are unlikely to have been formed by non-biological mechanisms, because there was no highly agitated water at the discovery sites. Namib Dune, mentioned in Lin’s paper, was shown above on the right side of Figure 3. The follow-up to this article is here.